Ah, Easter – the celebration of our lord and saviour, chocolate. Not only do we get to turn our out of office on (email me and I’ll tell your kids the Easter bunny isn’t real) and gorge ourselves on bags of Easter eggs, but feasting of all forms takes to the forefront to be enjoyed across four days choc-full of food comas. In the spirit of Good Friday and great food, we’ve put together a tasty list of what you should be eating and drinking over the Easter long weekend. Thought: if we said ‘hop to it’ would you die a little inside? Luxe Emporium Hotel South Bank is helping you get your fishy fix on Good Friday. A stunning three-course menu paired with a glass of Mumm Cordon Rouge awaits from 11:30am-2:30pm, with three hours worth of Moreton Bay bugs, marinated shell scallops and freshly shucked Sydney Rock oysters plus much more in store. You’ll be sitting sky-high at The Terrace, overlooking everyone having a v. average Friday. Find out more and get tickets here. Seafood on Easter is iconic, as is Regatta Hotel’s annual buffet. On Friday 19 from 12pm-3pm, stuff your stomach (but not your purse, can you imagine the scent) with a delicious selection of fresh seafood, hot and cold dishes, and dessert. You’ll be swimming in a feast of steamed snapper, prawn laksa, baked Atlantic salmon, and tonnes more. Head here for the finer details and to secure your spot. Saké to me, Sydney! 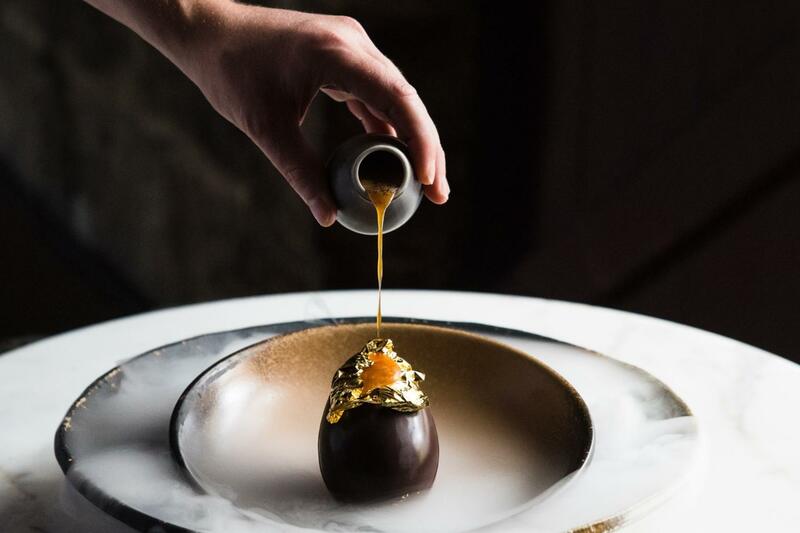 To distract Sydney-siders from unlivable rent costs, (we assume) all Saké restaurants over the border permanently offer the sweetest treat known to man – the Dragon Egg. From April 15-25, our Brisbane-based Japanese fave will let us in on the goods, being a dessert filled with almond, passionfruit, milk chocolate and white chocolate, and decorated with colours of silver and rouge and served with a hot, salty-sweet miso caramel sauce. When in Easter! Behold – the Easterita. El Camino Cantina is giving birth to their biggest, sweetest cocktail yet throughout the entire month of April, constructed with chocolate liquor, white chocolate syrup, tequila, triple sec and topped with Cadbury mini Easter eggs. I hope my dentist notices that I’ve been flossing. Putting all their eggs in two baskets, Munich and The Bavarian are giving kids the chance to rightfully work for their choc. Head down at 1pm sharp on April 21, where the restaurants’ Easter bunny helpers will scatter eggs throughout the venues for a good old fashioned hunt. Cute. High Tea, but make it Easter. Three tiers of treats will be waiting to greet you at W whichever Friday, Saturday or Sunday (or Easter Monday) you choose in April. Expect nothing less than hot cross scones, wattleseed and macadamia mini Easter eggs, and cheeky glasses of champers if you upgrade your package (for champagne, we’d do anything). Shut up and take our money. Find out more by calling the venue on (07) 3556 8888. 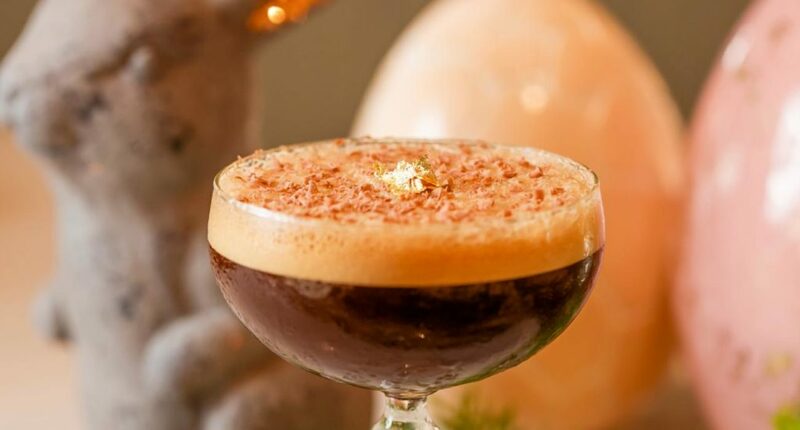 Enjoy a month-long offer of Belgian chocolate espresso martinis topped with gold leaf – bougie! Every little and big kids’ dreams are about to come true at Victoria Park’s Easter Eggstravaganza! Over Easter Saturday and Sunday, you can expect to meet the Easter bunny, take part in egg and spoon races, weep your way through the adorable petting zoo, get your craft on and hit the jumping castle before nap time. There’s plenty more in store, and you can find out all the fun deets here. If you’re absolutely done with chocolate (and you’ll definitely hit that point), take a breather and tackle some parmy’s and pints at Little Big House. Every Sunday in April, plus all Easter Weekend long (because the chicken parmy definitely came before the Easter egg), Little Big House’s first-of-its-kind Parmy and Paddle Degustation will be up for grabs if you enjoy living your best life. Expect a classic chicken parmy with pacific ale, chicken parmy spring roll with Brookvale Union ginger beer, parmy katsu sandos with cold brew coffee kolsch, and chicken parmy wings with pale ale all in one delicious sitting. Book a table here. Over the Easter long weekend, Rocklea’s Brisbane Markets will have all the entertainment you need to distract yourself from the stress of having forgotten to do you Easter feast shopping. Luckily you’re in the right place, so pick up some seafood, sweets and produce and breathe a sigh of relief. Brunch, booze, beats… and Easter eggs. Beirne Lane’s Brunch Club is serving an Easter Sunday special like none other, featuring three hours of bottomless brunch and a selection of sips (depending on which package you choose; you know we’re gonna be all up in those mimosas). Dress to impress and settle in for plenty of Easter surprises, plus crisp ceviche bowls, sandos and brekkie parfait. Find out every last detail and get tickets here. Before turning water into wine, wake up on the ride side of the bread with Easter Sunday Breakfast at Sirromet. Enjoy an indulgent breakfast buffet including eggs cooked to order, bacon, sausages, beans, hash browns, Danish pastries, waffles, donuts, fresh fruit, smoothies, cheese and more. See more and get tickets here. A cheeky hop, skip and a (two hour) drive from Brisbane will be worth the trip, as the first Imbil Easter Carnival takes to Mary Valley from April 19-21! From dinner under the stars on Good Friday to market stalls, artisan workshops, barefoot bowls and ginormous puzzles across the rest of the weekend, a whole lot of family fun awaits. Don’t be sad, it’s carnival – and you can find out every last detail here. We don’t want none unless its hot cross buns, hun.